the card for: THE DEVIL AND DANIEL JOHNSTON, the movie bio of the reclusive artist, Directed by JEFF FEUERZEIG. The movie received the ‘WINNER AMERICAN DOCUMENTARY – DIRECTING AWARD – SUNDANCE FILM FESTIVAL’. POSTCARD IMAGE by: DANIEL JOHNSTON. 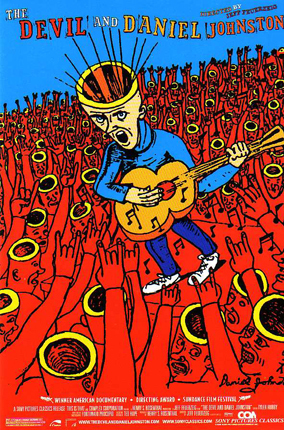 ‘The Story of An Artist, Daniel Johnston, A Retrospective’ – that ran from March 17 – April 15, 2006 at CLEMENTINE GALLERY – the word on the street was that the show sold out, and that he was too ill, to attend the opening in person.